Stay at Piermonde Apartments and explore Cairns on your next holiday. At your doorstep you have the best of what Cairns has to offer including shops, restaurants, harbour foreshore, the Esplanade, Night Markets, Marlin Marina and Reef Casino. Piermonde Apartments is the perfect base for your next Cairns getaway. Choose to stay in one of our two or three bedroom self-contained apartments, each with air-conditioning and ceiling fans, cable television, complimentary Wi-Fi access with up to 1GB and most feature a large balcony. Enjoy the amazing weather of Cairns on our sundeck or take an invigorating swim in our sun-soaked outdoor pool. 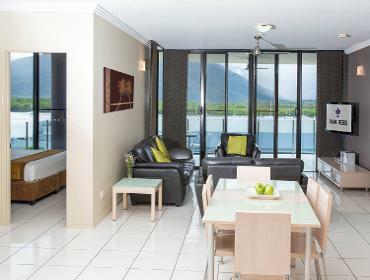 Spacious, modern rooms conveniently located in beautiful Cairns. Piermonde Apartments offers comfortable stay with all the modern conveniences including air-conditioning, ceiling fans, cable television, internet access and large balcony (most). The Cairns Convention Centre is located just across the street from the hotel, making Piermonde Apartments the optimal choice for your next business trip. Please ask our friendly staff to assist with your business related requirements. Entertainment and adventure options are limitless and you can take advantage of our convenient tour booking service; snorkel in crystal clear waters of The Great Barrier Reef, sail away on a catamaran or get a little more adventurous with white water rafting on the Barron and Tully Rivers. Located in the heart of Cairns, on the shores of the Coral Sea, Piermonde Apartments is the perfect choice for guests staying for business or pleasure, or both! A short stroll from Reef casino, Marlin Marina, Night Markets, the Esplanade, harbour foreshore, restaurants and shops. Piermonde Apartments truly is your home away from home while is Cairns, so you can get the most our of your business or leisure stay. Long stay and extended bookings are also available. The Cairns Convention Centre is easily accessible, located just across the street from the hotel, making your next business trip easy and convenient.